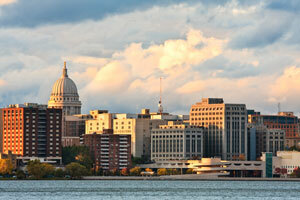 Madison is the capital of the state of Wisconsin and is known as “Mad City”. There are numerous advertising opportunities within the city. Utilize outdoor advertisements close to any of the many universities including The University of Wisconsin-Madison and Edgewood College.This would allow you to capture customers at relatively cheap billboard costs. Also target your audience with out-of-home advertising near Capitol Square and other downtown high traffic areas. The major roadways that service the city also provide billboard possibilities. Billboards on I-39, I-90, or I-94 would generate high traffic exposure of your business. Zip Codes: 53701, 53702, 53703, 53704, 53705, 53706, 53707, 53708, 53709, 53710, 53711, 53713, 53714, 53715, 53716, 53717, 53718, 53719, 53725, 53726, 53744, 53777, 53778, 53779, 53780, 53782, 53783, 53784, 53785, 53786, 53787, 53788, 53789, 53790, 53791, 53792, 53793, 53794.